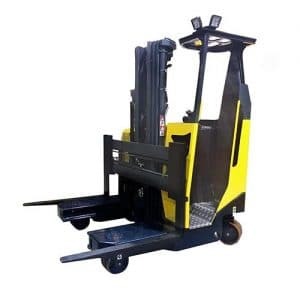 Multi-directional Forklifts allow movement for long and awkward loads in all four directions, and you get all the benefits of counterbalanced forklifts, sideloader forklifts and narrow aisle lift trucks in one vehicle. Avoid the need for extra forklifts by using these versatile machines indoors and out. We also have models that are UL safety rated. Read more to see a full list of our multi-directional forklifts. The C-Series is a multi-directional forklift and quickly moves in all directions to easily maneuver long loads through narrow aisles and doorways. The Combi C-Series handles long loads safely and efficiently. It also effortlessly carries loads along the side of the machine which helps reduce fleet and product damage. Designed to be three forklifts in one, the C-Series acts as a side loader forklift, counterbalance forklift and narrow aisle forklift. Fitting down narrow aisles with long heavy loads is a breeze, the aisle only needs to be the width of the machine. A wide range of fork sizes, attachments and spreaders are available, this means there’s no need for double handling material. The Combi C-Series also can operate indoors and outdoors. 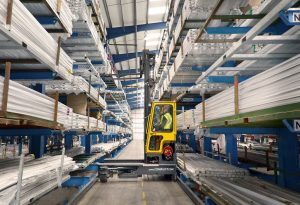 Forklift safety increases when transporting loads at low levels on the integrated platform allowing more stability compared to transporting loads lifted at a high level. The cab is located on the side of the mast giving the operator clear visibility of the load at all times. At the same time, having full visibility of what’s in front and back of the machine. 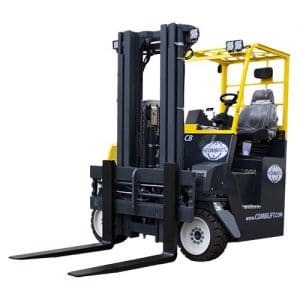 The Combilift CB series 4 way forklift is truly unique as it’s a zero turn radius counterbalance forklift that goes sideways with a full range of steering. This very versatile machine can work in a narrow aisle with long material as well as vans. This truck acts as three forklifts in one having the benefits of a counterbalance, sideloader, and narrow aisle forklift. The Combi-CB can carry palletized loads from the front similar to a conventional lift truck, but it can also carry long loads driving sideways making it work for several different load types. Designed to keep the forklift operator safe, the Combi-CB is built with a sturdy cage to protect the driver on all sides. The driver can also feel comfortable with a fully adjustable seat to maximize visibility. The CB unit’s ability to handle long loads close to the ground as opposed to overhead make it a must for safe operation with long loads . 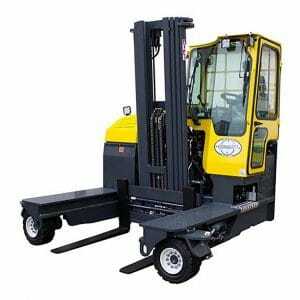 This forklift will reduce your fleet and can also fit into a truck for loading or unloading. The Combi-CB forklift also works just as good indoors as it does outdoors to tackle all types of jobs. The small size and maneuverability of the Combi-CB makes it a great forklift for various different applications. To best fit your warehouse needs, we can customize the forklift to lift any size load! The Combi-MR is a stand on reach truck, as well as multi-directional making it great for very tight aisles. This reach truck can also withstand driving on various surfaces because of it’s large rear wheel with 360 steering rotation. Low operator entry and exit and ergonomic controls on the Combi-MR reach truck provides safer, quicker, and more efficient picking. Changing speed and direction adds to more efficient procedures using multi-functional controlled joystick.